Lawrence* will work all night when he has to. It’s that dedication that has led him to be recognized nationally as one of Canada's leading trial and appellate counsel. Larry has particular expertise in international commercial arbitration. He also maintains a successful complex and cross-border litigation practice. Larry advocates§ for learning outside of the courtroom, teaching international law at the University of Toronto, and trial advocacy at Osgoode Hall Law School and The Advocates' Society, promoting hard work‡ as one of the keys to success. 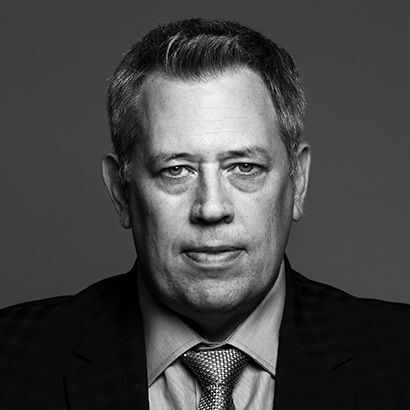 Known for his work ethic and knowledge across many sectors, Larry is a tireless advocate and dedicated teacher. .
One of Canada's leading trial and appellate lawyers, Lawrence has broad experience in mergers and acquisitions, shareholder disputes, complex class actions, infrastructure disputes, procurement matters, securities issues, tax litigation, commercial arbitrations and insolvency restructuring. He has served as lead counsel in several complex international commercial arbitration matters involving large energy infrastructure and power generation projects. He appears regularly at all levels of the Canadian courts, including the Supreme Court of Canada. Lawrence is also deeply involved in legal education. For a decade he was an adjunct professor in the Political Science Department at the University of Toronto, where he taught international law. Since 1998 he has been an adjunct professor at Osgoode Hall Law School, where he teaches trial advocacy and serves as a team leader and instructor in the school's Intensive Trial Advocacy Workshop. He also teaches courses in trial advocacy skills for The Advocates' Society. Counsel to Galway Gold Inc in an investor-state arbitration against the Republic of Columbia before the International Centre for the Settlement of Investment Disputes (ICSID). Counsel to the defendant Imperial Metals Corporation in a class action relating to alleged breaches of the Securities Act in connection with a breach of the tailings storage facility at the Mount Polley Mine. Counsel to a defendant cell phone manufacturer in a proposed class proceeding alleging that cellular phones designed, manufactured, and sold by various defendants emit excessive amounts of radiation that allegedly causes adverse health effects. Counsel to a mining company in a commercial arbitration relating to a joint venture. Counsel to a property owner in a dispute relating to a collapsed retaining wall consisting of gabion baskets. Counsel to the appellant, Natural Resources Gas Limited, on an appeal from a decision of the Ontario Energy Board which provided only a short three year renewal of its franchise agreement with the Town of Aylmer. Counsel to a UK-based energy company in a series of international commercial arbitrations relating to the sale of a nuclear power generation facility. Counsel to a software distributor in an international commercial arbitration relating to a breach of a distribution agreement. Counsel to the Ontario Securities Commission in a lengthy insider trader prosecution arising out of a hostile take-over bid. Counsel to one of the defendants in a class proceeding against numerous flat glass manufacturers alleging a price fixing conspiracy and breach of the Competition Act in the Canadian flat glass market. Counsel to the defendant in a dispute relating to claims for liens under the Construction Lien Act in a large construction project. Counsel to the respondent technology company in an international commercial arbitration relating to alleged non-payment of invoices and a priorities dispute in a multi-jurisdictional insolvency. The proliferation of parallel class proceedings in multiple Canadian provinces often defeats the very purpose of class proceedings: the avoidance of a multiplicity of actions. In order to streamline procedures, ensure consistent results, and encourage judicial economy, judges in several provinces have started demanding greater co-ordination among both class counsel and the courts. In McKay v Air Canada, Chief Justice Hinkson took this trend even farther in approving a settlement distribution plan by simply reproducing the reasons of the Ontario Court in Airia Brands v Air Canada. Any action described by the Judge as novelty on steroids provides an opportunity for the Court to balance the opportunity to develop new law, with the importance of rigorously applying existing law. This duality arose in a motion in the class action Fisher v IG Investment Management Ltd (2015 ONSC 3525), recently decided by the Ontario Superior Court. Lawrence E. Thacker joined a faculty at The Osgoode Intensive Workshop Negotiation Skills and Strategies for Litigators on April 11, 2017. Lawrence E. Thacker presented at the CCCA 2012 World Summit. Lawrence E. Thacker spoke on panel discussion at the 2011 CCCA National Spring Conference. Lawrence E. Thacker presented at the University of Toronto Litigation Association's luncheon discussing some of the tactical decisions and strategies he employs in his cases. Lawrence Thacker provides individualized feedback to participants at the Advocates' Society Civil Litigation Skills Development Program on April 1, 2009 in Toronto. Lawrence E. Thacker was an instructor at the Federated Press' Intensive Seminar on General Counsel's Role in Maximizing Board Effectiveness. The seminar was attended by a large number of general counsel for Canadian and U.S. corporations.